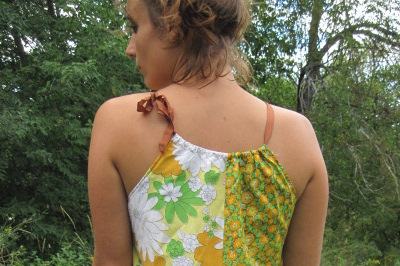 This dress is Up-cycled from vintage bed sheets printed with bright, cheerful flower prints. 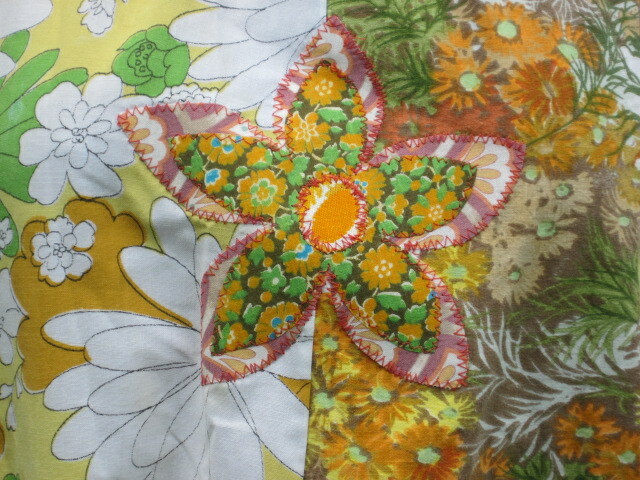 I have actually sewn two of these, the only difference being the applique flower, which you see a detail of in this gallery. 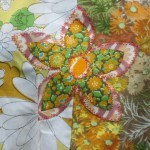 The straps are made from silky ribbon and it has an applique flower on the front. This dress is nice and roomy, perfect for playing outside, a picnic or harvesting crops in the garden. This dress will fit several sizes, small, medium and large as the design is pretty free, not recommended for larger than a 38 bust. not finished with 'finished' things! UpCycle means more than resurrecting rubbish, it's a pinnacle philosophy for higher and better use. Up, up and replay!